Decay: Since I’ve had an iPhone for seven years and replaced it with a newer model once, it’s clear that many things it can do will only be operative for a few years. As the OS is updated, an app only continues working if developers keep maintaining it. So rarely used functionality might just be gone by the rare occasion when I need it, or the interface will have changed so much that I’m basically learning it from scratch. However, I want a microwave oven that just works. I don’t want it to change its user interface when a software update downloads at 2 AM. Fragmentation: Different companies have different operating systems. The problem is not just that they don’t work together, but that their business models involve making them incompatible. As the App Store grew, however, Apple stopped mentioning web apps. iOS still supports them, but they are kind of hidden and not as functional as they could be. Apple makes more money from iOS apps that are exclusive to their platform. The Android and Amazon App stores are similar. Any smart device will belong to a particular ecosystem of software and other smart devices. Even with internet connectivity, different things won’t necessarily play well together. And it can be good business for companies to make sure that they don’t. It’s inconvenient to have different remote controls for the TV and the video player, but it would be a nightmare if every appliance was linked to one of several different, incompatible control systems. It’s easier that my dumb coffee maker just has a rocker switch on the front of it. Corruption: Although updates can break some functionality, I update software regularly because I don’t want to be behind the curve on security patches. Every thing in the internet of things has the potential to become a zombie bot. 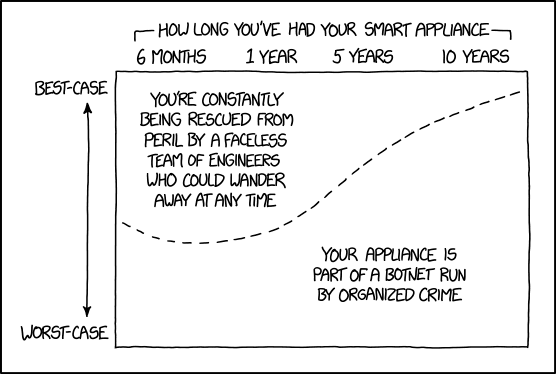 Even if it leaves dishes spotless, I don’t want my dishwasher to mine botcoin for foreign hackers or join a hoard of other dishwashers to launch a denial of service attack. An apt XKCD comic by Randall Monroe.